You’re gonna love these! 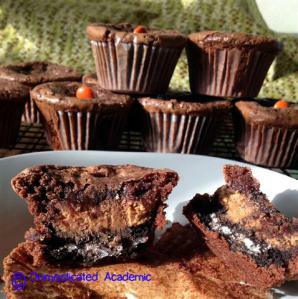 Who wouldn’t love cupcakes made of our favorite things – brownies, peanut butter cups and Oreos? What makes them even better is how EASY they are to make. Domesticated Academic calls these “Crack Brownies” and I can see why. They might, just might, last a day at my house. Make brownie mix according to directions or however you like to make it. Set aside. Line cupcake tins with cupcake liners or use non-stick spray and spray them. Drop a tablespoon of brownie batter in the bottom of the cupcake liners. Take one oreo and place it in each cupcake liner. Remove the peanut butter cups from the package/liners and place one on top of each oreo. Top each cup with a spoonful of batter. Distribute evenly. Bake at 350 degrees for approximately 15-20 minutes.